You will love your Mid 2014 Macbook Pro refurbished by GainSaver. 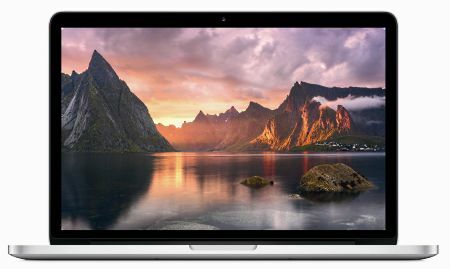 These affordable 13.3-inch Macbook Pros come with a Retina display, two Thunderbolt 2 ports and a fourth generation Intel Dual Core i5 processor. They have the performance to run all of your most demanding applications, and youll see exactly what youre doing with the ultra high resolution Retina screen. The discount Macbook Pro has a 13.3-inch Retina display with a stunning 2560 x 1600 resolution. The screen has such tiny pixels that they are difficult to distinguish. There are no jagged edges on text characters because the detail is so fine. If you do much reading for school or business, you will enjoy the fact that its almost like reading from a print page. You can use the extra pixels in the Retina display to create a much bigger desktop. Its great if you like to have a lot of windows open at the same time or need to see more cells in your spreadsheet application. With the Retina display, you dont need an external monitor anymore to get additional desktop space. You can also set the scaling so that some of the extra desktop is reduced, and the additional pixels are used to create bigger text with even sharper detail. The used and refurbished Mid 2014 Macbook Pro runs on the fourth generation Intel Dual Core i5 processor. The processor incorporating hyper-threading, which lets each of the two cores simultaneously handle multiple tasks. Its great for blasting through all you software programs, whether you are doing video production or playing games. The bargain priced Macbook Pro uses PCIe-based flash storage technology to securely store your data files. There is no mechanical hard drive that could potentially crash. Flash storage is much more reliable. And the PCIe-based flash drives are incredibly fast. Booting up your cheap used Macbook Pro takes just a few seconds, and launching applications or switching between windows happens so fast you wont believe the difference. The PCIe-based flash drive and fourth generation Intel processor work together to improve the performance of the discount Mid 2014 Macbook Pro, and give the power of a desktop computer. Its ideal for the most demanding applications from graphics design to audio and video production. Shopping from GainSaver allows you to custom configure your inexpensive Macbook Pro with a larger hard drive, which is something you cant do when you purchase new. With a high capacity flash drive installed by GainSaver technicians, you can store movies, videos and data files that you can instantly access while traveling on business or visiting clients. Its a cost effective way to add even more performance to this cost effective Mid 2014 Macbook Pro.